UTSA’s Steve Henson has been honored as both the NABC District 11 and C-USA coach of the year. Steve Henson has won his second major coaching honor of the season. He was named on Wednesday as the National Association of Basketball Coaches (NABC) District 11 coach of the year. 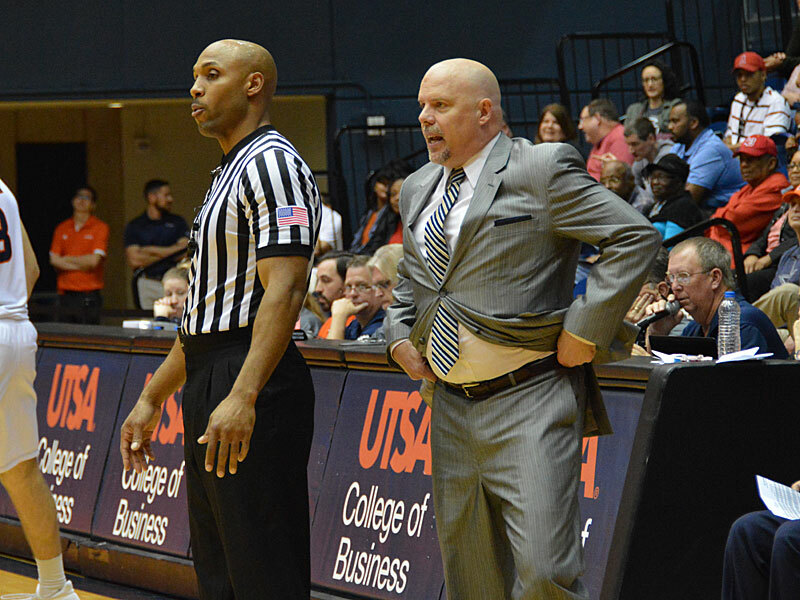 In his second year at UTSA, Henson previously had been cited as the Coach of the Year in Conference USA. Henson won the award on the eve of a CollegeInsider.com Postseason Tournament quarterfinal between UTSA (20-14) and Sam Houston State (20-14). UTSA hosts Sam Houston Thursday night at 7. The Roadrunners finished 5-27 in 2015-16, the year before Henson arrived. They improved to win 14 games last year and 20 this year on the heels of back-to-back strong recruiting classes. Two years ago, Henson brought in a freshman class that included Giovanni De Nicolao, Byron Frohnen and George Willborn III. Last year, his staff added freshmen Jhivvan Jackson and Keaton Wallace and transfer Deon Lyle. Jackson, the Conference USA Freshman of the Year and a second-team, all C-USA selection, averaged 18.4 points per game. UTSA suffered a blow to its postseason chances when it lost Jackson to a knee injury against Louisiana Tech. But even without Jackson, the Roadrunners split the next two games on the road to finish the regular season 18-13 overall and 11-7, good for fifth place in the C-USA. UTSA defeated UTEP to reach the quarterfinals in the C-USA tournament before losing to Marshall, the eventual champion. In the CIT, UTSA hosted Lamar last Wednesday, recovered from a slow start and won 76-69. Sam Houston State finished the regular season 19-13 overall and fourth in the SLC standings with a 12-6 record. Moving into the SLC tournament at Katy, the Bearkats routed New Orleans 85-63 before losing in the second round to Southeastern Louisiana, 89-79. Sam Houston won at home in its first game in the CIT, beating Eastern Michigan 69-62 on Monday, to qualify for the quarterfinal game against UTSA. The Bearkats have won 20 games or more in four of the past five seasons under coach Jason Hooten. Hooten is in his eighth year at the school. Sam Houston — Chris Galbreath, Jr. leads Sam Houston, averaging 14.6 points and 7.9 rebounds. John Dewey III averages 10 points and 4.5 assists. Transfer Marcus Harris, who played in high school at MacArthur, is averaging 9.4 points in his first season with the Bearkats. UTSA — Junior transfer Deon Lyle has stepped up to average 17 points in the five games since Jackson has been out. He has led UTSA in scoring four times during the stretch. For the season, Lyle is averaging 11.5, Wallace 11.2, Nick Allen 8.8 and De Nicolao 8.4. Willborn, a 4.5 ppg scorer last year, has boosted his average to 7.8 as a sophomore. Byron Frohnen averages 7.6 points and 7.3 rebounds. This entry was posted in College basketball and tagged Steve Henson, UTSA Roadrunners by Jerry Briggs. Bookmark the permalink.